Analytic-Synthetic Dichotomy 7: Naming and Knowledge. I have repeatedly insisted that definitions define word usage. Perhaps, before we go any further, this needs to be fleshed out a bit. Naming an object, a process, or an attribute involves little if any knowledge. Take the word poison. This term can be defined as any chemical substance that injures, impairs, or kills an organism. Note that this definition doesn't actually specify what chemical substances are in fact poisons or whether such substances exist. It merely states that if a chemical substance injures, impairs, or kills, then we will call it a "poison." Does this definition of poison provide any non-trivial information about matters of fact? No, it does not. It is quite possible to know the definition of poison and yet know nothing of any specific poison. The definition of poison merely provides a naming convention. If you come across a substance that harms or kills an organism, it's "poison." But a naming convention is not knowledge. Knowing what to call things is different from knowing about things. What, then, is the meaning of the concept "man"? "Man" means a certain type of entity, a rational animal, including all the characteristics of this entity (anatomical, physiological, psychological, etc. as well as the relation of those characteristics to those of other entities) --- all the characteristics already known, and all those ever to be discovered. Whatever is true of the entity, is meant by the concept. I have already criticized this view of meaning on the assumption that a person can only mean what he knows. It could also be criticized for assuming that people always mean what is "true of the entity." What if they mean something else? What if they intend to use words to deceive or to rationalize? But there's another criticism I would like to introduce in this post, one which I have previously broached but which needs to be explained in more detail. Peikoff speaks about the concept "man." This concept, he says, includes "all the characteristics already known, and all those ever to be discovered." Now the concepts that people actually have in their minds don't, as far as we can tell, include "all the characteristics known and to be discovered." How could they? An individual's conception of something can only include what he knows of it. Peikoff, however, writes of concepts as if they are some sort of supra-human thing, identical in all respects regardless of where they might reside. Analytic-Synthetic Dichotomy 5: Meaning, Intention, and Truth. In my last post, I criticized the Objectivist theory of meaning for being both quasi-Platonist and quasi-positivist. However, that only skims the surface of what is wrong with the theory. There is a much more serious problem with the Objectivist theory of meaning, which is this: it is not true. As a theory of meaning, it is inextricably incoherent. It confuses meaning and truth. If taken to its ultimate, logical conclusion, it would assert that all meaning is true, which would imply that no one could ever mean something that was false. 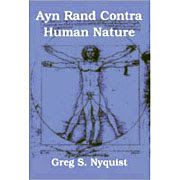 In practical terms, it encourages Rand's followers to become obssessed with how conclusions are made, rather than with whether such conclusions can be tested. Such are the fruits of Rand's attempt to build a theory of definitions and concepts on the out-moded and anti-scientific views of Plato and Aristotle. Peikoff declares that "a concept means the existents which it integrates." [IOTE, 98] Meaning, however, doesn't work like that. An individual, particularly an egotist, may presume he means, when using some word, all the "integrated" existents; but really he only means what he asserts of it. If a man believes that, in speaking of something, he means everything about it, he is obviously deluded; for he cannot possibly know everything about an object; nor would it be a cognitive ideal worth striving for, since most knowledge is trivial and not worth knowing at all. What people mean when they say something or think about something is merely their conception of the things they are speaking or thinking about. Such a conception, to the extent that it contains true information about matters of fact, is always partial and inadequate. Knowledge is not a mirror: it does not exhaustively describe, or minutely characterize, its objects. It doesn't have to. Human beings only require enough information to survive and procreate. Since a word is a symbol for a concept, it has no meaning apart from the content of the concept it symbolizes. And since a concept is an integration of units, it has no content or meaning apart from its units. The meaning of a concept consists of the units — the existents — which it integrates, including all the characteristics of these units. Metaphysically, an entity is: all of the things which it is. Each of its characteristics has the same metaphysical status: each constitutes a part of the entity's identity. Epistemologically, all the characteristics of the entities subsumed under a concept are discovered by the same basic method: by observation of these entities. The initial similarities, on the basis of which certain concretes were isolated and conceptually integrated, were grasped by a process of observation; all subsequently discovered characteristics of these concretes are discovered by the same method (no matter how complex the inductive processes involved may become). Rand's strange doctrine that "a concept means the existents which it integrates" leads her to adopt a quasi-Platonist view of concepts. Concepts are not seen as psychological processes occurring within an actual human brain, but as ideal forms which real concepts can approach, if never quite match. Peikoff complains about the Platonic "essence-accident" dichotomy, which he suggests is at the root of the ASD. But there is a dichotomy in Rand that is far more perplexing and gratuitous: the dichotomy between concepts as immaculate representations subsuming all the characteristics of a referent, and the actual concepts human beings hold within their minds. Apologists for Rand will undoubtedly cry foul over my description of the Objectivist theory. But I have merely drawn out what is clearly implied by the theory itself. "A concept subsumes and includes all the characteristics of its referents, known and not-yet-known," declares Peikoff (undoubtedly speaking for Rand). How can a concept existing in a human mind include not-yet-known information? The only way this theory makes any sense is to assume that a concept is a kind of ideal construct, which our minds are trying to approach. Actual concepts (i.e., concepts existing in human minds) must fall short of that ideal construct, because human beings, as even Rand admits, are fallible. On this view of concepts, the aim of knowledge would be to approach that ideal concept as much as is humanly possible.